New Academic paper reveals how Tantric / kundalini yoga is Yogi Bhajan's basic faith while Sikhi is only an off-shoot of his Tantric system. 1. "Sometimes referred to as ‘gora’ (caucasian or ‘white’) Sikhs – they differ from Punjabi Sikhs most significantly in their emphasis on Kundalini Yoga as a key spiritual practice, though they also are contrasted by the special names they are given, by their reverence towards Yogi Bhajan, by their vegetarianism, by the equality granted to women with respect to Sikh ceremonies and attire, and by their dress – they wear all-white clothing and women as well as men wear turbans." "–spiritual transformation, and becoming open to one’s higher or Infinite Self or Soul in union with God and integrating this spiritual core with one’s mind and body (Bhajan 2007, 101)." B. Stoeber says that according the Kundalini Yoga theory, breathing impacts people spiritually, as well. C. Stoeber asserts that "Kundalini Yoga asanas are crucial in stimulating kundalini (spiritual energy), which opens one to an awareness of one’s higher Self or Soul in union with ultimate Reality, and in integrating it with one’s egoic self and psychic personality (Bhajan 2007, 100, 101)." "They read and contemplate scriptures, they practice the inner cleansing techniques of yoga, and control of the breath. But they cannot escape from the company of the five passions (lust, rage, greed, pride and attachment). They are increasingly bound to egotism. This is not the way to meet the Supreme One and Only. I have performed these rituals so many times. Finally I collapsed, exhausted, at the door of my Creator and I prayed to the Beloved One, ‘Please, grant me a discerning intellect’”." Dr. Trilochan Singh made this very same conclusion about Yogi Bhajan, in 1977. 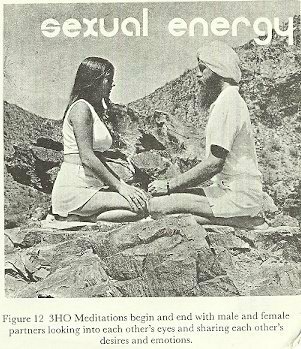 I quote from the book "Sikhism and Tantric Yoga": Yogi Bhajan, "...honestly replied that Tantra (White as he calls it) is his basic faith while Sikhism is only an off-shoot of his Tantric system. Dr. Trilochan Singh replies, "The reason he (Yogi Bhajan) gave was that he believed Sikhism has no meditation techniques. I (Dr. Trilochan Singh) told him (Yogi Bhajan) that Sikhism has more specific, fruitful, and spiritually exalting techniques of meditation, but his (Yogi Bhajan) misfortune is that he has never studied Siri Guru Granth Sahib, and never cared to live according to Sikh Discipline."